Rotary ovens are one of the important types of industrial ovens used today, which are used for several types of drying purposes. These ovens have a heating chamber, where the materials are moved in a circular motion. The materials are on a turntable inside the heating chamber. These ovens may feature single or multiple heat zones depending on the application. Armature Coil Company is one of the leading manufacturers of custom rotary ovens, including industrial rotary dryers, as well as rotary rack ovens. These ovens offer fast and easy way of cleaning, heating, and drying metal parts. 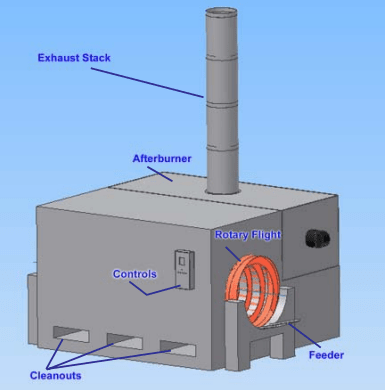 Here is a step-by-step explanation of the working of industrial electrical rotary ovens provided by us. The material is introduced through the feeder. This material is showered through hot gas streams by the rotating retorts. In the hot zone, the heated forced air helps improve the drying process. It scrubs all processed material from the surface, and carry away the vapor in the out-feed zone. There are three chambers in an insulated retort enclosure. These chambers are controlled in separate zones. Unlike other industrial rotary ovens, the heat is indirectly fired on the processed material. This helps avoid heat impingement directly on the material, and also helps control temperature, minimize energy costs, and oxidation. All these benefits in combination aid the oven achieve efficient heat cleaning. During the process, the combustible materials undergo thermal breakdown at 800°F. (427°C). The retort produces an exhaust, which is drawn from the out-feed and in-feed zones into the afterburners – there are two of them in number. These afterburners operate at temperatures above 1,500°F. (798°C). This high temperature helps incinerate vapors and smoke. At the end of the process, the metal parts and ash are discharged at a controlled speed from the out-feed zone of the retort. This discharge may be collected at an optional accessory output feeding apparatus. The oven is manufactured using 11 GA heavy gauge steel, and is coated with an anti-corrosive finish. This construction provides long-term performance against other ovens in the market. The heating chamber is equipped with a manual reset button, which helps control the excess temperature. Every ACE rotary oven is equipped with a wide variety of automatic safety controls, including fail-safe water check system, pressure relief hatch, over temperature water suppression system, emergency shutdown, etc. These ovens feature a primary, as well as secondary water suppression systems, which help prevent the run-away fires. The oven is equipped with an afterburner, which helps provide additional air for combustion of odors and smoke. Also, discharges created by the oven are the harmless byproducts. Thus, these ovens will help users comply with stringent air emission standards set by EPA. Armature Coil Equipment has always worked closely with its customers to understand their requirements, and serve them above their expectations. 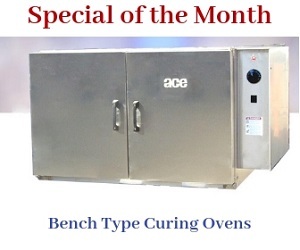 Our stringent adherence to quality control techniques has helped us become one of the most preferred electric rotary oven manufacturers in the USA. INCREASE Your Return on Investment & run more efficient Request a Rotary Oven Quote Today!